ARA has received the tick of approval for the Triennial Recertification of its quality management systems. The audit, includes a detailed review of ARA’s Quality – ISO9001:2015, Environmental – ISO 14001:2015 and OHS – AS 18001:2007 Management systems. Covering both ARA Property Services and ARA Indigenous Services, the three-day audit included a review of our policies and procedures, a site audit of Tertiary Education client and interviews with staff and cleaners to highlight improvements made since our last audit. 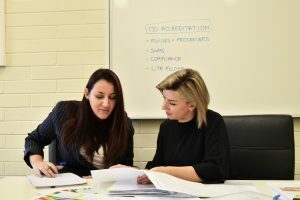 National Risk, Compliance and Quality Manager Alexandra Faull said that auditing body, QCSE, gave ARA’s system the full tick of health to successfully retain the internationally recognised certification. “It’s a team effort to maintain our ISO Certification. Everyone on the ARA team should be so proud of the part they play in ensuring that we not only met, but exceed the expectations of our Certified Health & Safety, Quality and Environmental Management Systems,” she said.